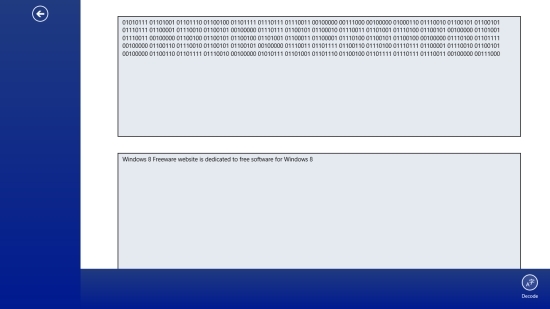 My Binary Translator is a free Windows 8 Binary Converter app that lets you convert text to binary form or vice-versa. Using this free Windows 8 Binary Converter tool, you can code a text to binary form or decode binary to text, with just a single click. This app is extremely lightweight and easy to use. It is capable of doing the assigned function very accurately without any distraction. 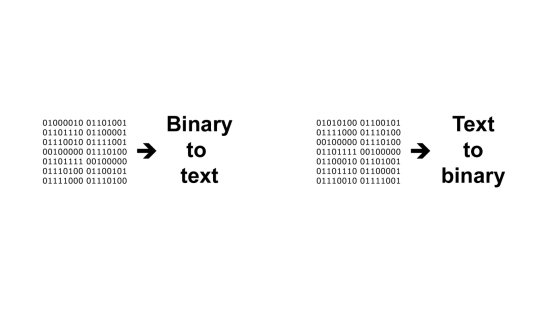 Converting text to binary form or binary to text is just a matter of fraction of seconds with My Binary Translator. My Binary Translator is freely available in Tools category of Windows Store. To view the app directly in Windows Store, you can click on the link given below at the end. 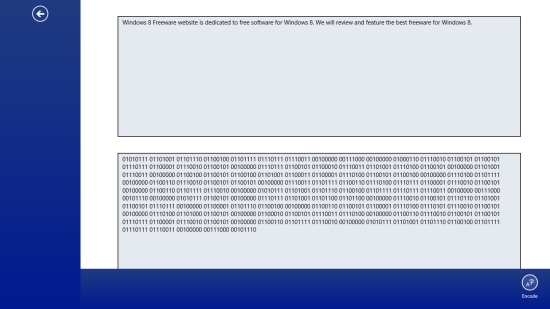 Let’s see how to use this free Windows 8 Binary Converter app. As I mentioned, the app is extremely easy to use. All you need to do is to put the desired input text or binary content in the specified text box. And leave the rest to the app. To use this free Windows 8 Binary Converter app, first install and launch this app on your Windows 8 system. The main page of the app displays two options: Binary to Text and Text to Binary. Click on the desired option. The next screen will display two text boxes. Enter the desired input text/ binary content in the upper text box, as specified in the app. You can type text/ binary content or copy paste it in the input text box. Now, right click on the screen. The app bar will display code/ decode options with reference to the respective operations. The output binary/ text content will get instantly displayed in the text box below. Also check Base Conversion, TEXT2IMAGE, and Text to Speech TTS. My Binary Translator is a quick tool to convert text to binary content and vice-versa. Try this app and share your feedback via comments. Get My Binary Translator here!